After a shower I dug out this sachet of Organic Surge Tropical Bergamot Body Lotion to try out and actually found that I had two which was fortunate as one sachet was only enough to do half my body. I am a huge fan of Organic Surge, I have liked every product that I have tried from them and I am happy to report that the Tropical Bergamot Body Lotion lives up to its claims. It smells wonderful, the orange scent is subtle and appealing. As it is a lotion it is fairly runny in consistency but absorbs quickly so that you can dress pretty much straight after application. The scent doesn't last but my skin was left feeling soft 17 hours later. If you are looking for affordable skincare that doesn't contain parabens, SLS, artificial colourants and fragrants I strongly recommend you give this range a try. 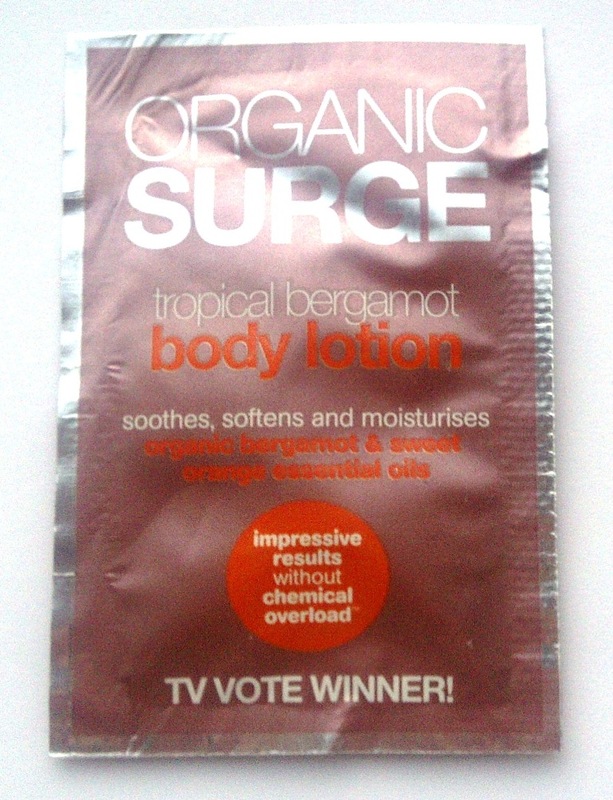 Organic Surge Tropical Bergamot Body Lotion costs £5.99 for 200ml.